There are two charts that have been making their way around the media blogosphere recently, and they both tell aspects of the same story: namely, a story about how much power Facebook (s fb) has when it comes to helping content “go viral” or reach vast audiences. In a very real sense, social optimization has replaced what used to be called search-engine optimization or SEO, and that means Facebook has replaced — or is close to replacing — Google (s goog) as the subject of online publishers’ fevered hopes and dreams. The biggest problem with this state of affairs, of course, is that publishers are just exchanging one master for another. In the end, they are just as subject to the whims and vagaries of Facebook and its changing algorithms as they were to Google — both are giant, proprietary platforms who ultimately have their own interests at heart, as much as they talk about how they benefit humanity. And that means the playing field for publishers can suddenly shift underneath their feet, just like the battlefield in The Hunger Games is altered on the fly by the game-makers who run the show from behind the scenes. As you can see, Google referrals remain in roughly the same range as they have been for some time, in the sense that the search engine sends between 40 million and 80 million visitors month to the BuzzFeed network of sites. Facebook, however, has gone from being in the same general range to more than double the top end of that range — so that it now sends about 160 million visits per month, almost four times as much as Google now does. Kafka’s post includes all the usual disclaimers about this data: the fact that it only comes from BuzzFeed and not a range of different content publishers, the fact that BuzzFeed consciously tailors its content for Facebook the same way other networks such as Upworthy do, and so on. But still, those are some fairly large numbers, and they make the point better than any number of blog posts could about the tangible impact that Facebook is having on news outlets and other publishers. Jon Evans, who writes occasionally for TechCrunch, also posted some data that he got from an application he wrote called Scanvine, which tracks social sharing of content from various publishers, and it also shows that BuzzFeed is benefitting far more than traditional media outlets from a socially-driven traffic strategy. 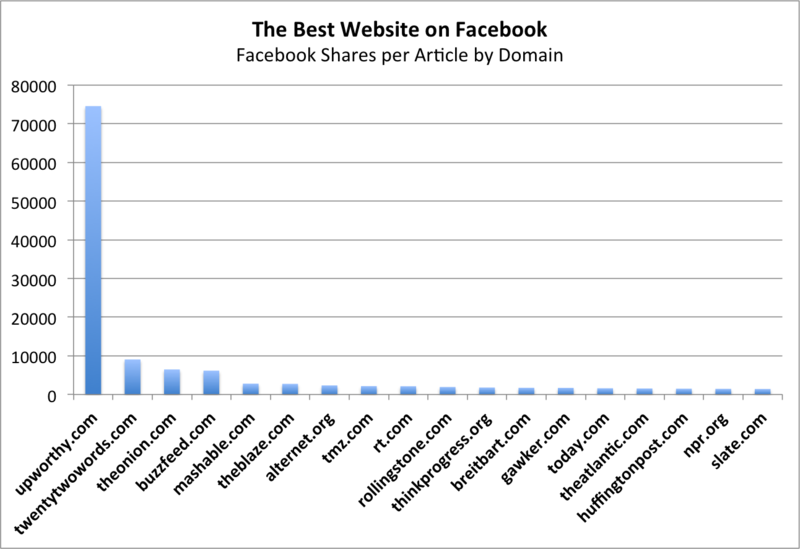 The second graph makes a similar point as the first, in that it shows just how much Facebook traffic can help drive the fortunes of online content: it comes from a post that Derek Thompson of The Atlantic wrote, which notes that the single largest beneficiary of the “Facebook effect” has been Upworthy — to the extent that the number of “shares” that Upworthy articles get on the social network dwarfs even other viral-content specialists such as BuzzFeed or Mashable. In a post at Reuters, blogger Felix Salmon comes up with a fairly complicated algorithm of his own to describe how viral content works, and the central role that Facebook plays in either helping or hindering that virality. But the bottom line — as he noted on Twitter — is that the only one really in charge of how this game ends is Facebook: as gamblers used to say about the large mob-owned casinos in Las Vegas, “The house always wins.” Upworthy may be the beneficiary of Facebook’s algorithms right now, but that could change in an instant. In fact, Facebook has strongly suggested in interviews with some media outlets — including Re/code, back when it was known as All Things Digital — that it is not favorably disposed towards cheap or “low quality” viral content of the kind that publishers like Upworthy and BuzzFeed often post. If the network moves on that basis, both sites could find their traffic tap turned off. Jonah Peretti has talked openly about this risk before. As he and others at the company describe it, Twitter (s twtr) and Facebook are like the rails on which the trains run — if they change the rules or the construction of those rails, the BuzzFeed train won’t even be able to leave the station. Facebook’s ability to knee-cap publishers in this way isn’t just a theory either: both the Washington Post and The Guardian got huge numbers of readers from their “social reading” apps in 2012, right up until Facebook tweaked its algorithms and killed them dead. So we've traded content farms for viral mills. 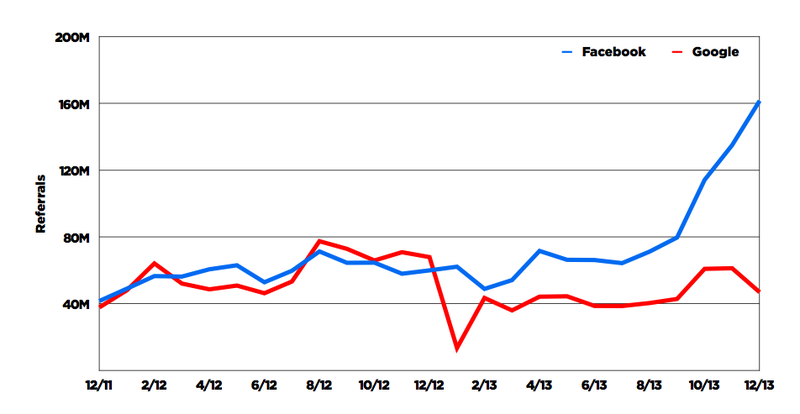 Who's betting that FB doesn't retool their algorithms as much as google did to combat them? Anyone who has dealt with Google understands this risk intuitively, since the search giant has been doing much the same thing to different content categories and markets for years. To take just one example, so-called “content farms” like Demand Media and Associated Content derived huge value from creating low-quality content that matched key search terms — right up until Google tweaked its algorithm with the “Panda” update in 2011, and down-ranked their content to the point where it was barely even visible. Is it unfortunate that Google and Facebook have enough power in their respective markets to have that kind of impact on a content company? Sure it is. But at this point, that’s just the way things are, and at the moment Facebook plays a huge role in determining how well your content will do. And while it feels great to be riding that wave, you never know how long the ride will last, or how suddenly it might dry up and leave you stranded. Should have known this was a post by Mr. Ingram. Informative. Engaging. Appreciated.